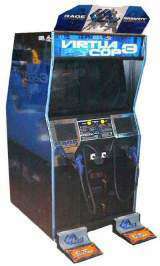 Virtua Cop 3 © 2003 Sega Enterprises, Limited. Five years ago, crime lords controlled the streets of Virtua City. 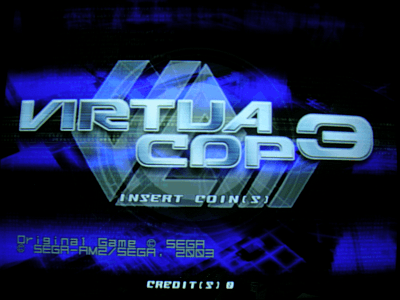 They were repelled by a new brand of cop... a Virtua Cop. Since then, the crime lords have been busy plotting a new attack and once again, Virtua City is calling on the Virtua Cops. When its over, the crime lords will be wishing they'd never crawled out of there holes. 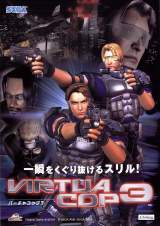 Virtua Cop 3 features a new standard weapon 'The Guardian II', which is more accurate and powerful than anything a beat cop had ever carried. Collect new weapons through out the game and press the special weapon button to change your firearm. When you are in a bind activate the ES Mode, a revolutionary Virtua armament, time will virtually stand still giving you all the time you need to react to your enemy before they get the jump on you. 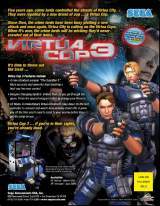 Virtua Cop 3 was released on April 25, 2003. The E.S. (Exceeding Sense) mode that was implemented in Virtua Cop 3 was inspired by some special effects in The Matrix Film. * Unlock File 4 : To play the secret 4th file, you must successfully complete the mini-missions presented in the 2nd and 3rd case. The 3rd case must also be played last.